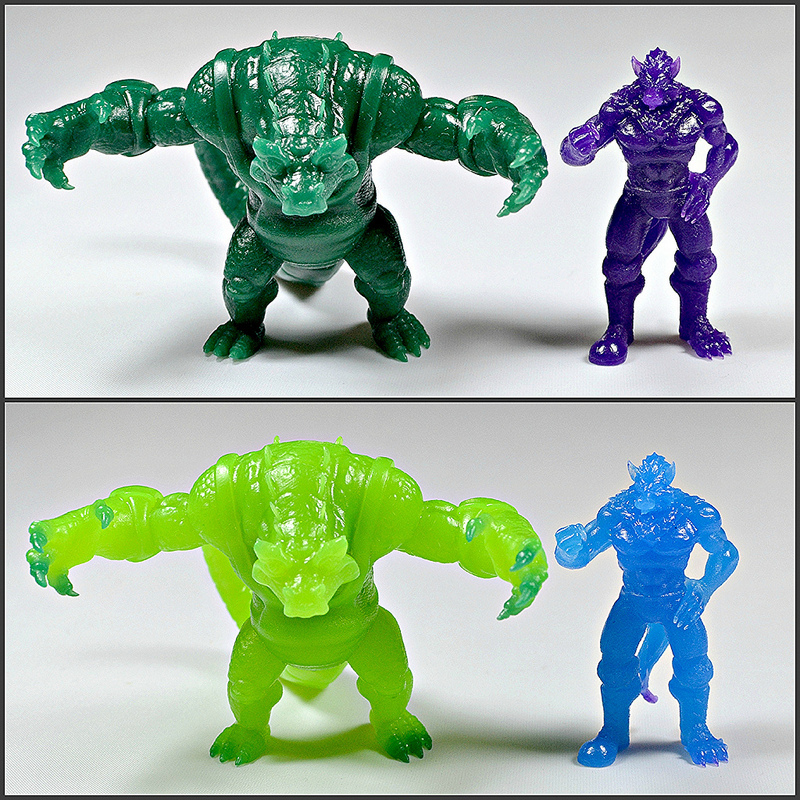 WHAT: Mystical Warriors of the Ring is a new indie toy line from Fantastic Plastic Toys that was first teased in late 2012 and debuted for sale this past weekend at C2E2 in Chicago. 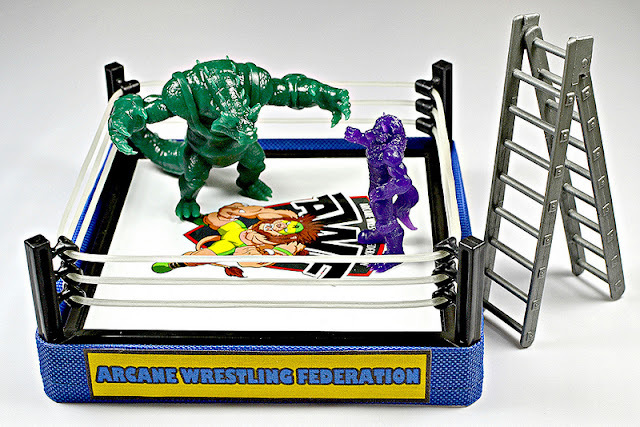 It's sort of a fusion of M.U.S.C.L.E. and Battle Beasts, featuring 2" anthropomorphized animal wrestler figures. 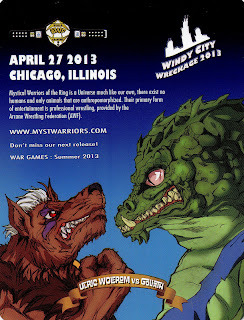 The first release in the line includes two wrestlers--the wolf, Ulric Wolfrom, and the crocodile, Goliath--as well as a wrestling ring and a few other goodies. While attending C2E2 I was lucky enough to pick up one of the first sets sold. I wasn't completely sure if I wanted to dive into yet another toy line when I saw photos online, but after having a set in person I have to say I'm officially sold! The figures themselves are very, very cool. Goliath in particular is a gorgeous, eye-catching sculpt. He's a real brute (Ulric looks somewhat diminutive in comparison--it's hard to think he'd stand a chance in the ring). I can see people getting into the line based on this figure alone. Ulric is very nicely done too, but a hulk of a character like Goliath is naturally going to steal the spotlight. The package says the figures are made of "high quality UV resistant urethane," which gives them the feel of a hard, rather lightweight (but not cheap) plastic. Personally, I always prefer mini figures done in a more flexible plastic or rubber, but I don't really mind the material of these guys. I'm just not going to try to find out how easily they'd break, because it seems like it might not take too much. 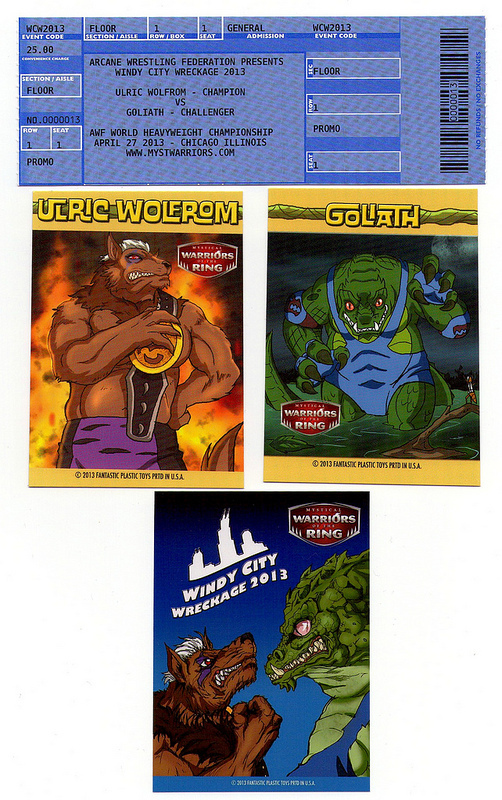 A few different versions of the sets were offered at C2E2, each featuring different figure colors: one with metallic green and purple, one with metallic gold and one with thermal color change (dark green to yellow-green and purple to blue). I opted for the thermal set and am really happy with my choice. The color change feature works very well when you put the figures in hot water and definitely adds an extra element of fun. They are also translucent once changed, and even in their standard form there's a very slight translucent quality to the material which I love. At $50 for one of these initial sets, some might wonder if the price is worth it for what you get. I did, but after having the set in hand I can say the price is absolutely justified. It's obvious a great amount of care and work went into putting the sets together, and you get quite a bit in addition to the figures themselves. First, there's the wrestling ring, complete with "Arcane Wrestling Federation" graphics, a cloth outer base, glow-in-the-dark rubber ropes and a plastic ladder. If it looks familiar to anyone, it's because Fantastic Plastic Toys actually bought a bulk amount of them from a manufacturer who produced some that were being sold at Dollar Tree stores, and customized them for MWOTR. 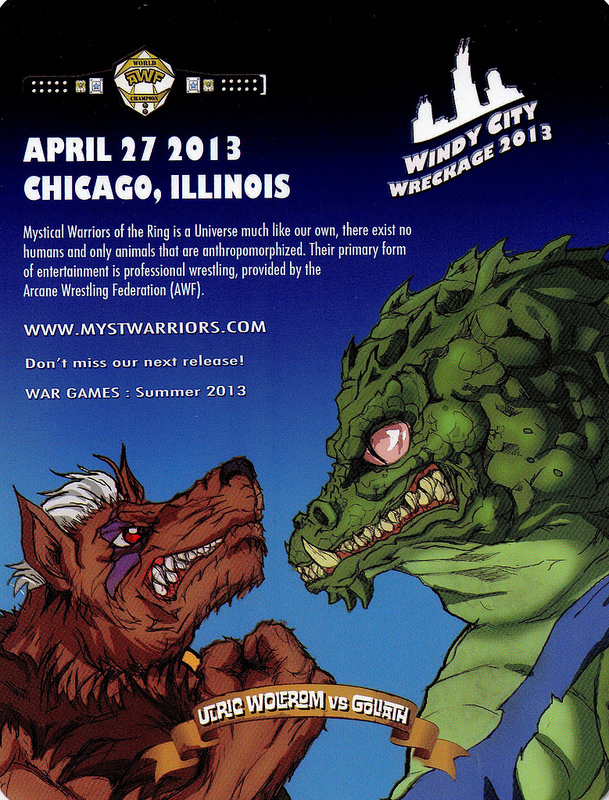 In addition to that you get a mini comic filled with awesome artwork from Lee Burbridge of BigMan Toys detailing the match between Ulric and Goliath, trading cards with artwork, background info and stats for both wrestlers, and even a realistic ticket with match details that will be able to go toward redeeming for an exclusive figure at the end of the year. 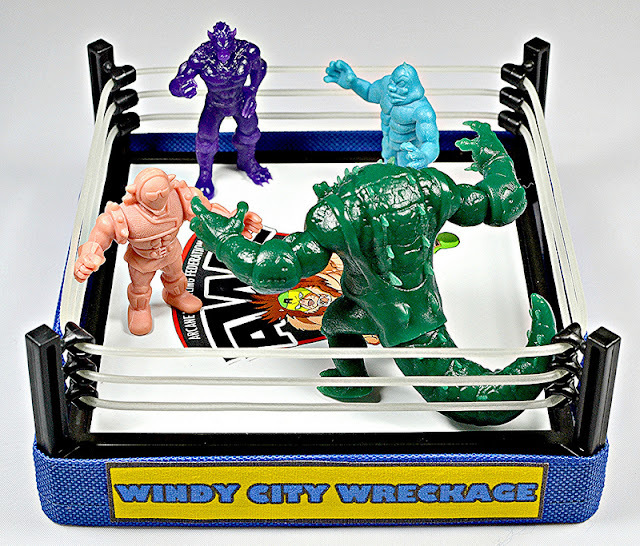 The creators made it a point to make details for the C2E2 sets unique to the event (dubbing the match "Windy City Wreckage," using the date of the convention for the match date, etc), which makes them extra special. Another nice touch is that it all comes in clamshell packaging that you can open and close without damaging. I'm really glad I decided to pick one of these up at the show and am now excited for what else is to come with Mystical Warriors of the Ring. There's a preview of some of the upcoming figures up on the line's website--looks like there's plenty more great stuff in store. 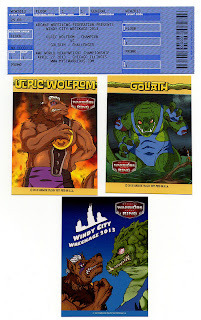 WHEN: Initial sets of with the first two figures (Ulric Wolfrom and Goliath) debuted for sale in April 2013 at C2E2. 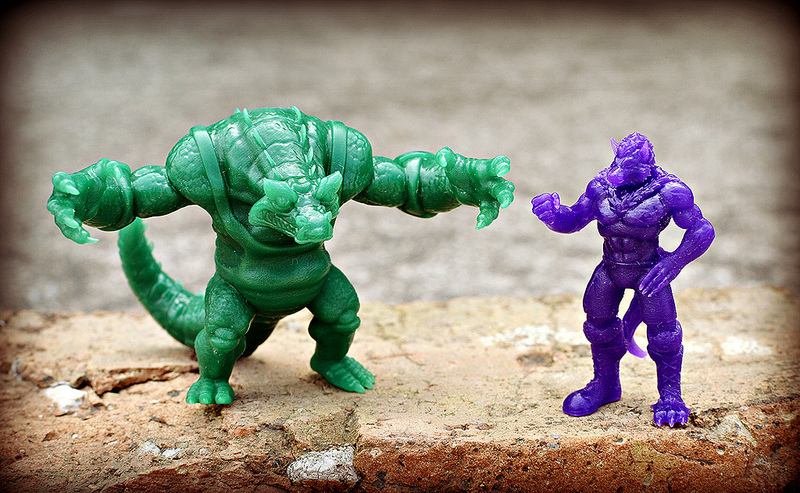 Fantastic Plastic Toys say they plan to have more sets for sale online in May, to ship in June. There are four additional releases planned for the rest of the year as well--check out the schedule here. WHERE: The various releases will be available at conventions and through the Fantastic Plastic Toys online store. WHO: From Fantastic Plastic Toys. me puedes conseguir un Goliath termal? me puedes vender uno? gracias!!! !